I am participating in a lot of challenges lately. Not that I mind, though! I have joined the bakers from Bake the World a while ago but so far I hadn’t been able to join in the fun for various reasons. When I discovered what they had in store for March’s challenge, I knew I didn’t want to miss out. This unusual Croatian bread (unusual for me, at least) is similar to other sweet breads baked around the world for Easter. Eggs, too, play an important part in the symbology. I looked up many recipes (in various languages) but finally decided on the one by Ana, whose beautiful blog won’t see the last of me. I followed her recipe quite faithfully although I halved the recipe, the only minor change I made to the ingredients was to substitute part of the milk with water to get a fluffier dough (it was a dream!). As for the method, I changed it slightly: I melted the butter in the lukewarm milk and then added it to the dry ingredients alternating with the beaten egg. My facilities are a bit limited so I didn’t dry the eggs (also because the ones I had weren’t white so I left them as Nature intended them to be). With the leftover dough I am now making some off-seasonal Stollen as I find the dough to be similar (you’ll have to wait till Christmas to see the photos!). Over medium heat, heat milk until small bubbles appear on the surface. Remove from burner and allow to cool – the milk should still be warm but not hot. Sprinkle the yeast and sugar in the milk, stir gently to combine and set aside to proof until doubled in size. Meanwhile, in a stand mixer with the whisk attachment, combine eggs, butter, sugar and salt at a medium speed for about 3 minutes. Begin adding the flour one cup at a time, alternating with roughly half a cup of the milk and yeast mixture. Repeat this until you have added 4 cups of flour and all of the liquid. After this point, begin adding ¼ to ½ cup of flour at a time, waiting until all of the flour is fully incorporated into the dough before adding more. Stop adding flour when the dough is smooth and no longer sticks to the bowl (you may or may not use all 6 cups of flour). Turn dough out onto a lightly floured surface and knead 4 or 5 times into a smooth, round ball. Place the dough into a lightly oiled bowl, cover with a clean tea towel and set in a draft-free area of your kitchen until it has doubled in volume, about 3 hours. When the dough has risen, punch the centre and turn out onto a lightly floured surface and knead for 2 minutes. Separate dough into the required pieces, depending if you are making loaves or dolls, or both (each loaf and doll requires 3 balls of dough to braid). Allow to rest for 15 minutes. Preheat oven to 350 degrees farenheit. 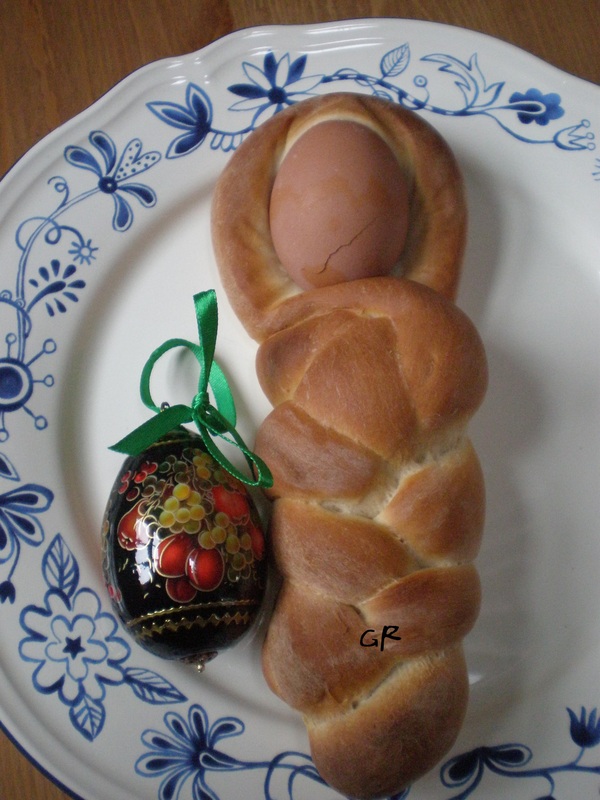 Braid the dough, following the pictures above (for the dolls, wrap the eggs in the dough as tightly as possible so that the eggs don’t fall out when finished baking) and place on a baking sheet lined with parchment paper. Brush with egg wash (1 egg, 2 tablespoons of water) and allow the dough to rest for 20 minutes before baking. Bake until the tops are golden and the bottom is light brown, around 20 minutes. Allow to cool completely before serving. My life in London has seen many (I do mean many) different addresses. Back when I was living in a flat at the top of the building I was very lucky to share it with very good neighbours. One such neighbour is Josy, a lovely Dutch lady whom I still refer to as “my Dutch neighbour” even though we have long ceased sharing the same address. Once I had to make a dish for a competition and I asked her if she would mind being my guinea pig. She did not one bit. Place the cherry tomatoes on a baking tray, sprinkle them with chopped garlic, sugar and oregano. Drizzle with olive oil. Bake in a very hot oven until they burst. Add some olive oil to a frying pan, add the chopped bacon and fry until crispy. Add the chopped mushrooms. (I am fastidiously fussy so “I” fry them in a separate pan because they have a lot of water, I drain them a bit and then I add them to the pan with the bacon). Add 1 whole smashed garlic clove. Add the cherry tomatoes which you’ve cooked in the oven. Leave to cook at low heat. Add the fresh basil leaves (just tear them with your hands) and the bocconcini. Boil the potatoes with the skin until they are tender (or bake them in the oven or microwave them). Peel them while still hot, warm at best but never cold as it will make your life much harder (the skin is almost impossible to peel once the potatoes are cold). Mash them and place them on the worktop (or use a plastic board). Next to the pile of mashed potatoes make a pile of flour of equal volume. Make a well in the centre of the mash and add the egg yolks, butter and pinch of salt. Mix quickly with your hands while you try to integrate all these ingredients. Add the flour and mix quickly. Leave to one side until needed. Take a small portion of dough (almond-sized, not bigger than that) and shape it in your hands like a small, thin round. Add a cube of cheese and roll the gnocco (yep! That’s the name) in your hands to shape it like a ball, enclosing the cheese (it’s actually harder to write this than to make it). Place on a floured tray and boil them in abundant salted boiling water until they float to the surface (they will initially sink). Once they float, they’re ready. Fish them out, drain them and serve with the sauce. Note: If you omit the bacon it can be a wonderful vegetarian dish. This was yesterday’s breakfast because I had to use up some pears I had. In my defence, may I say I didn’t have lunch afterwards, or rather that I ate one of these in lieu of lunch. 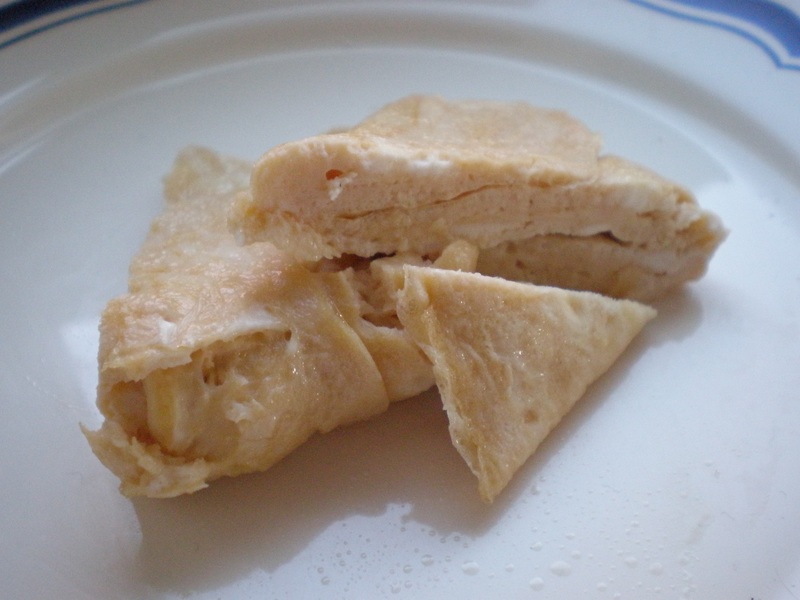 This is just what I like: simple, few ingredients, quick and tasty… and rustic, to top it up. Mix the flour, salt and sugar in a bowl, add the cold butter and, using a cornet, work it till it resembles fine breadbrumbs (you can use a food processor for this if you have one). Add the cold water and, still using the cornet, bring it together to form a dough. Wrap it in clingfilm and leave it to rest for at least 30 minutes in the fridge. Wash the fruit, quarter it (don’t bother peeling it) and slice it (I like the slices to be rather on the thick side). Put the slices in a bowl, add the lemon juice, the sugar and the cinnamon and mix well using your hands. When the dough’s ready, roll it out on a floured worktop. Try to roll it out in a roundish shape (it doesn’t matter if the circle is not too perfect, it will add to the rustic feeling). Fold it and transfer it to a greased oven tray. Unfold it and sprinkle it generously with ground almonds (this will absorb the juice from the fruit and will help keep the crust from becoming soggy). Place the fruit on top. If you’re feeling artistic, do it in a nice fashion , like I did. Sprinkle with more caster sugar and add a knob or two of butter. Bake in a preheated oven at 200C for about 10 minutes until the crust is golden. You can brush the dough with egg yolk before baking it (I didn’t) and you can also brush the top of the fruit with syrup as soon as it comes out of the oven. What with the photos I was taking and my hunger, I totally forgot but it will make them shinier. For my first “Forever Nigella” challenge, I knew exactly the dish I wanted to make. Not for nothing it features in Nigella’s Legacy episode of her Nigella Bites series. 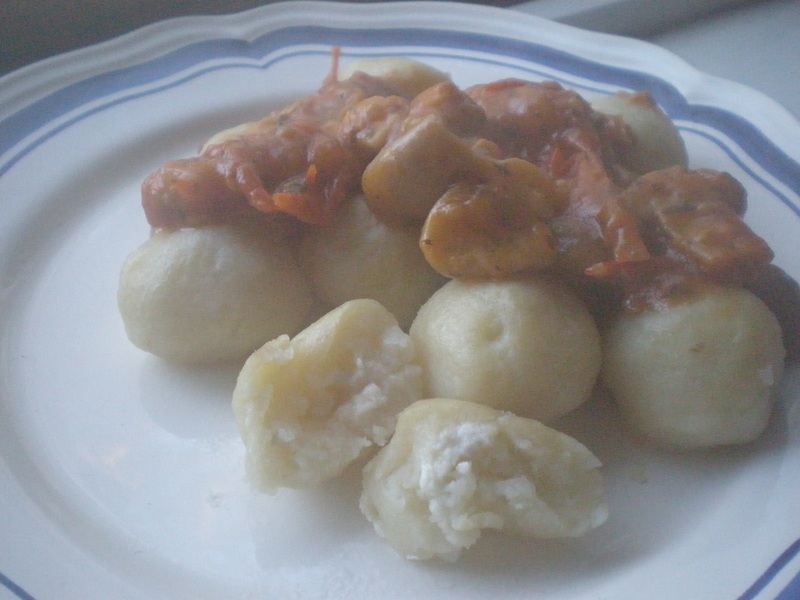 This month’s theme is “nostalgia” and for me, this dish is full of nostalgic evocations. 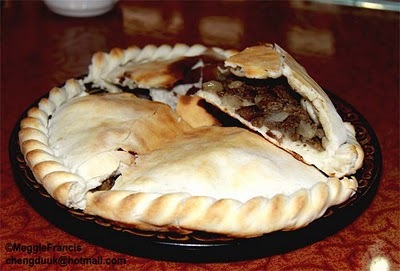 Granny Lawson’s pie is surprisingly similar to the empanadas that are such common fare in Argentina, where I come from. I have tweaked the recipe a bit to make it just so. I also noticed when watching the video that Nigella is not quite deft at making repulgue (the border which is twisted in order to prevent the filling from leaking) but I forgive her. So I’ve made it my way. Instead of making it square, I’ve made it round, the way I’ve seen it done in the Himalayas (in photos only, don’t get me wrong, I’ve never been there). Really, this dish seems to be universal and with good reason. Bon appétit! Measure the flour into a dish that will fit into the freezer (it doesn’t need to have a lid) and cut the shortening and butter into small – approximately 1/2-inch dice and toss them in the flour. Put in the freezer for 10 minutes. I tend to make pastry in my stand mixer, but a processor’s fine too. In whatever contraption – fitted with the flat paddle in the one, with the double-bladed knife in the other – mix until you have a mixture that resembles coarse uncooked oatmeal. Now, dribble in the chilled salted water, slowly, with the motor still running, until the dough looks as if it’s about to cohere, but stopped short of its actually clumping totally. Turn out of the processor (though you could still do this in the bowl of the mixer) and squidge together with your hands until all the pastry forms a cohesive ball. Dribble in a little more water if you feel it needs it. Divide into 2 pieces of equal size and form it into fat disks. Cover with plastic wrap and leave in the refrigerator for 20 minutes. And this can be done a good day or 2 in advance if it helps. Put the tomatoes in a bowl, cover with boiling water from the kettle and leave for 5 minutes. Drain, run under the cold tap, then peel, seed and chop roughly (or use canned tomatoes, chopped and drained). Peel and chop the onions, hard-boiled eggs and olives, too. In a large frying pan over medium heat, warm the oil. Cook the chopped onions until softened and beginning to colour, turning the flame down to low if they look as if they’re sticking. Turn the heat back to medium and add the chopped tomatoes and cook, stirring for a minute or so before adding the beef. Stir well, breaking up the clumps of meat with your wooden spoon as you go, then when the meat’s browned, stir in the chopped eggs and olives and season with the allspice and salt and pepper. Cook over gentle heat for about 20 minutes, stirring occasionally. Get a baking sheet out, and flour a surface and rolling pin. Remove the pastry from the refrigerator and roll out 1 of the disks until you have a thin, but not exaggeratedly so, rough square that will fit on the baking sheet, then place it on the baking sheet. Now roll out the second disk and leave it there while you cover the layer on the baking sheet with the ground beef mixture, leaving a margin of about 1-inch all around. With a bit of cold water and your fingers, dampen this edge. Place the second square of pastry on top and press the edges together to seal. Now, roll these edges back on themselves once or twice, then get a fork and press it, the tines curved side down, against this rolled border. 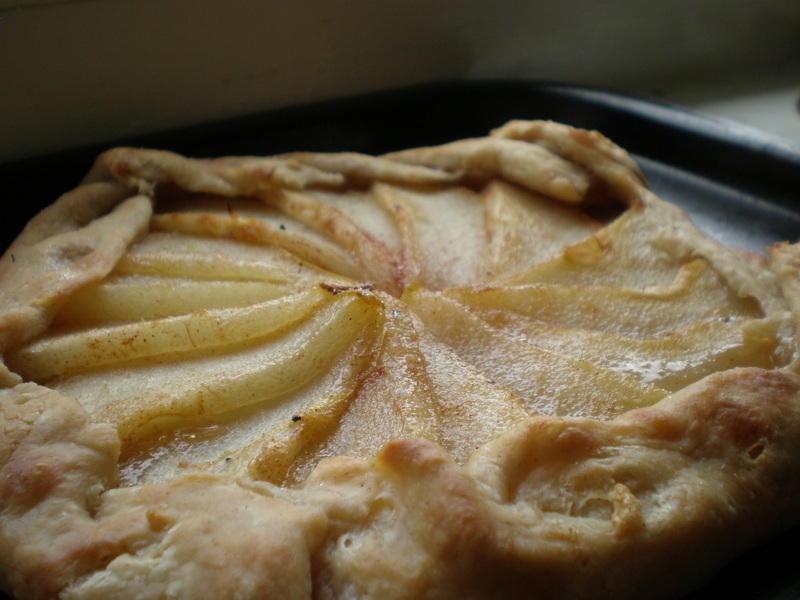 Prong the top of the pastry to make air holes and then beat the egg with a generous sprinkling of salt and brush the top and edges of the pie with it to glaze. Put it into the preheated oven for 20 minutes, by which time the pastry will be golden and cooked. Slice it into fat oblongs and eat warm with a vegetable or salad, or cold, wrapped in a napkin and without ceremony or cutlery. 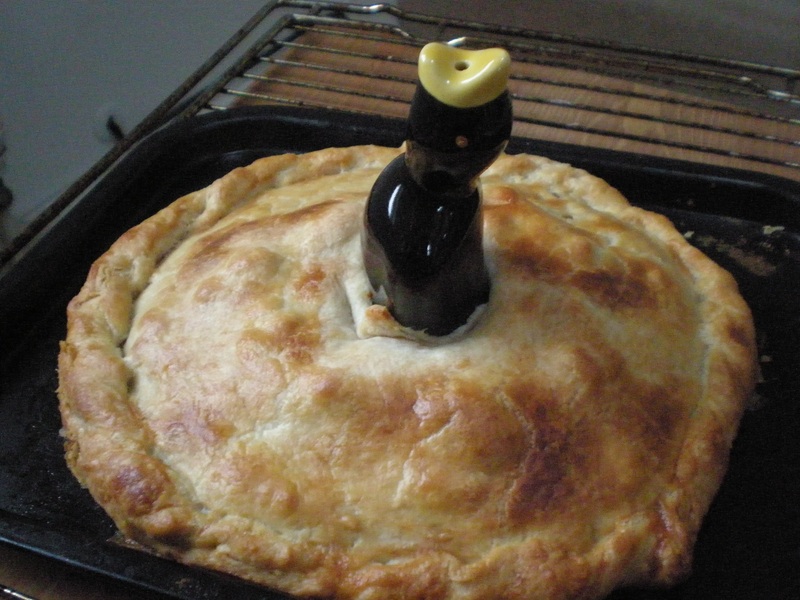 My changes: I added the boiled egg and the black olives as I was assembling the pie and not before. I think there’s no need to cook the olives or the egg any more than they already are (plus, you’re going to cook them even further, inside the pastry). I substituted fresh tomatoes with sun-dried tomatoes, simply because that’s what I had. And, as I mentioned before, I did my own repulgue. I also dispensed with the shortening and used just butter for the pastry. Other than that, it’s Nigella’s recipe. 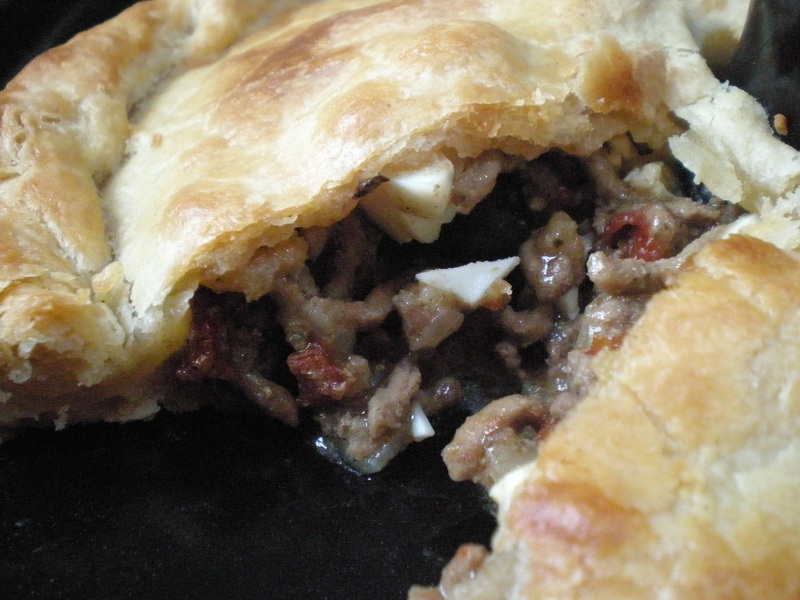 You can also make them as individual empanadas if you feel like it. Instructions come via Maki of Just Bento, a wonderful site if you’re into Japanese food (as I am). It is also a wonderful alternative to hard-boiled eggs if you are planning a picnic. 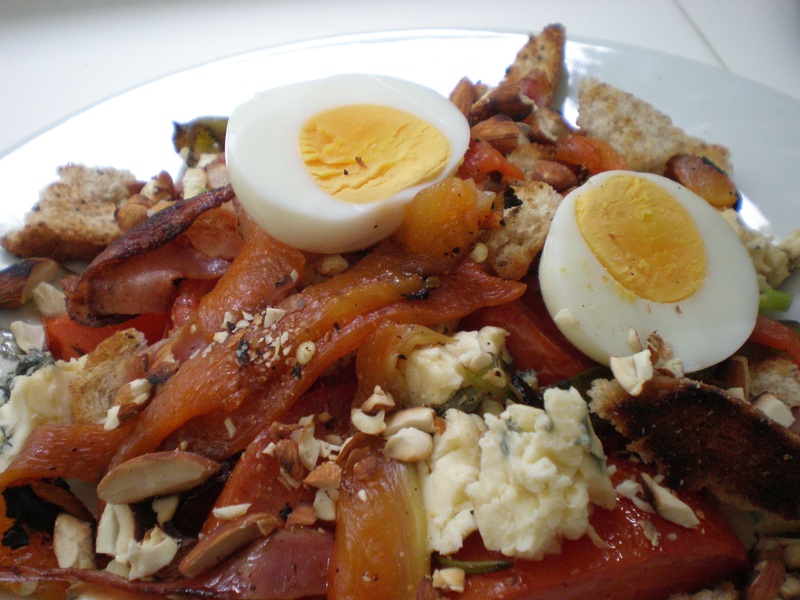 This is a salad I made back when I was in Argentina a couple of years ago. I made all sort of delicious food there because I had the opportunity of cooking for a family with an unusually well-provided pantry and kitchen garden so, as you can imagine, I was in heaven! This salad was born from playing with what was at hand on one particular day. Since I’ve twittered about it, I thought I might as well share it here. It had grilled peppers, blue cheese, croutons, toasted nuts, crispy bacon, boiled eggs, really good! This is something I have been wanting to post for a while. The recipe belongs to Blanca Cotta, a sweet lady from whom I learnt my first chops in the kitchen… via a children’s magazine and who gave me that love for cooking and, most importantly, she taught me that cooking can be a blast, it can be fun and it can truly become a passion and a way of life as it happened to me. Anyway, Blanca now has her own blog and I have had the immense satisfaction of being able to tell her all of this. I have made many recipes of hers over the years and her books are the ones that I keep coming back to, the empanadas and the dulce de leche everyone knows in London are made from her recipes (why tweak what is really a perfect recipe?). The recipe I am posting about now is that of a sweet bread, I have had the recipes for many, many years and one day I just said: “Today’s the day to make it”. It is a sweet bread, not unlike panettone or Stollen only that it doesn’t have any fruits or nuts to enrich it. Instead, it has a wonderful, crunchy, Streusel topping which makes it perfect for brunch or breakfast when you really want to indulge. Dissolve 50g fresh yeast (remember to halve this quantity if using dry yeast) in ½ cup of warm milk (I use the ones with 250 cc capacity), add 3 tbsp sugar, pinch of salt and leave to rest, covered for 5 minutes. Then add 2 beaten eggs, zest of 1 lemon and 2 ½ cups flour, alternating with 6 tbsp of melted butter. Once the ingredients have been mixed, topple over the worktop (scattered with flour) and knead quite energetically for at least 15 minutes. Then place the dough in a bowl (previously greased with melted butter), cover it and leave in a warm place to double in size. Then roll out the dough in a suitable tray (you can see in the photo I used a regular oven tray, the only one I had), leaving it 1 cm thick. Leave it again to prove, covered while you make the topping. For the topping: mix 100g cold butter diced small, 1 cup sugar and ½ cup of flour. Avoid using your hands (I use a scraper for this). Once the dough has risen again, brush it generously with more melted butter and add the topping. Bake it in a moderate oven (180°C or so) until it has puffed up, become golden and your whole house smells divine! You can see that, despite what I said above, I tweaked this recipe a little bit. 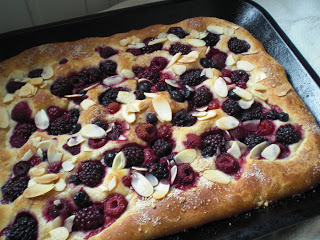 The first time I made it, I did it with the regular Streusel topping I’ve just described but having both read Nigella’s version in Nigella Bites and realising I had some flaked almonds and frozen berries in the freezer, I just couldn’t resist… Enjoy! If you try it, you will thank me….